Antibacterial treatment of car compartment and car ventilation system. Effective product for antibacterial treatment and elimination of unpleasant smells in car compartment. 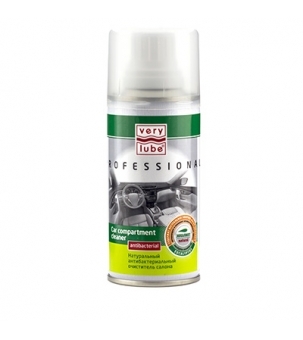 Deodorizes and disinfects interior space of the car, ventilation and air conditioning system. Contains an innovative product — odor absorber. The molecules of regular air fresheners just get mixed up with the molecules of unpleasantly smelling substance. Special active substances included into the formula of odor absorber destroy unpleasant smells and create the feeling of cleanness and freshness. Odor absorbers function according to the principle of chemisorption (chemical absorption of odorous molecules by an almost non-volatile substance). Treated inner surfaces of the car function as absorption surfaces. Start the engine. Open all airways. Turn off the air inflow from outside. Close windows and doors. Let the ventilation (air conditioning) system operate in recirculation mode at maximum capacity. Shake the can. Remove the lock ring. Put the can vertically in the center of car compartment (armrest, central console). Push the valve cap and open it by turning clockwise. Step out of the car, wait for 15–20 minutes. It is recommended to apply the product if necessary, but not less than twice a year (before the summer and winter season).